The typical Tuscan town of Montepulciano offers an ideal setting for a romantic wedding celebration, the city with its classic redbrick buildings and crowned by a ring of cypresses trees opens on the worldwide famous views of the hills and valleys of the Val d’Orcia and the Val di Chiana. The distance from Florence is of about 1,5 hours and approx. 1 hour from Siena. 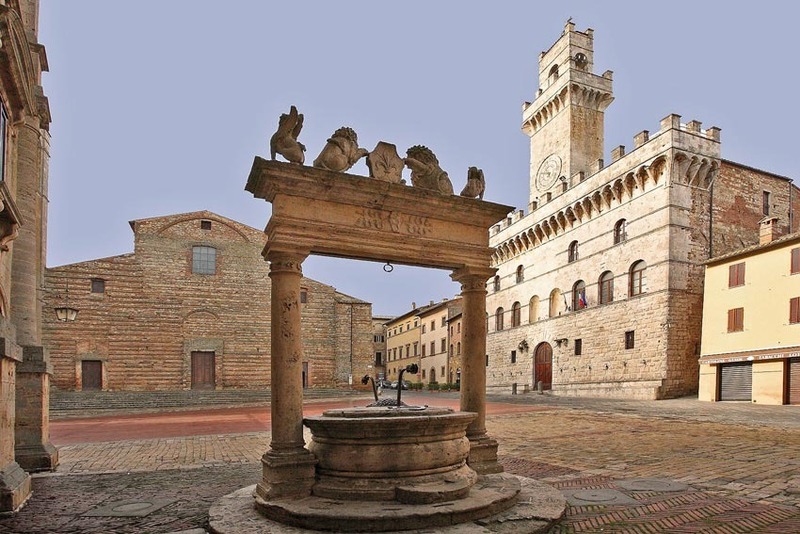 The most famous architects and artists of the Medieval and Renaissance period have left their mark on the buildings and structure of Montepulciano. In the town centre, imposing buildings follow one after the other (Palazzo Avignonesi, Palazzo Cocconi, Palazzo Cervini, etc) and the main square is adorned by beautiful monuments such as the Cathedral, the Palazzo Comunale, Palazzo Tarugi, Pozzo dei Grifi e dei Leoni. Montepulciano is known worldwide for his famous Vino Nobile. You must treat yourselves to a wine tasting section! The Marriage Hall is located in the "Palazzo Comunale" that with its central tower and the battlements, recalls the structure of the Palazzo della Signoria in Florence. Your civil wedding ceremony in Montepulciano will have the typical Renaissance romance and will be celebrated in this beautiful palace with a loggia in the internal courtyard and among the furniture and paintings that date back to its fast - after the Wedding you can climb up to the terrace or all the way on the central tower to enjoy the view of the surrounding hills for exceptional photos. In Montepulciano civil weddings are celebrated all days of the week including Saturday and Sunday mornings and afternoons. No need to take care of the sworn declaration a couple of days before as it can be done on the same day of the wedding, only a few minutes before the actual ceremony. For your special occasion, personalized vows and readings can be added after the standard civil rite and classical music can be played to enhance the ceremony and create the atmosphere – we do recommend that you take into consideration a violinist or an harpist or if you prefer a duo or trio.